the older i get the more i realize how important it is to hydrate and moisturize. believing i was fairly good with my water consumption, i was told by my acupuncturist, and my husband who i'd not listened to, that i was dehydrated and needed to be walking around with a bottle of h2o in my hand at all times; i'm at two liters a day presently working towards my goal of three. it's a lot harder than it sounds and requires a bit of restroom planning if i'm on the road, but i'm starting to see, and feel, the benefits. as well i've recently adopted a new routine to take time to take care of myself that fits nicely into a lazy sunday. i'm an early riser and have quite a bit of pent up energy which normally finds me organizing the house or working when i'm not supposed to be, leaving me depleted by not giving myself permission to just chill one day a week. so i decided an exhaustive 3 mile morning run/hike up a nearby mountain with my husband and our dog, luna, serves as the best way to tire myself enough to enjoy the rest of the day relaxing. coming home dusty and dirty i’m more than happy to do what i rarely do and lower my tired body into a very warm bath for the start of my “day of beauty”. this actually looks quite the opposite during the process. kai bubbles bubbling and body scrub in hand i go about taking the previous week away. it feels so good! a midday bath...what a luxury! 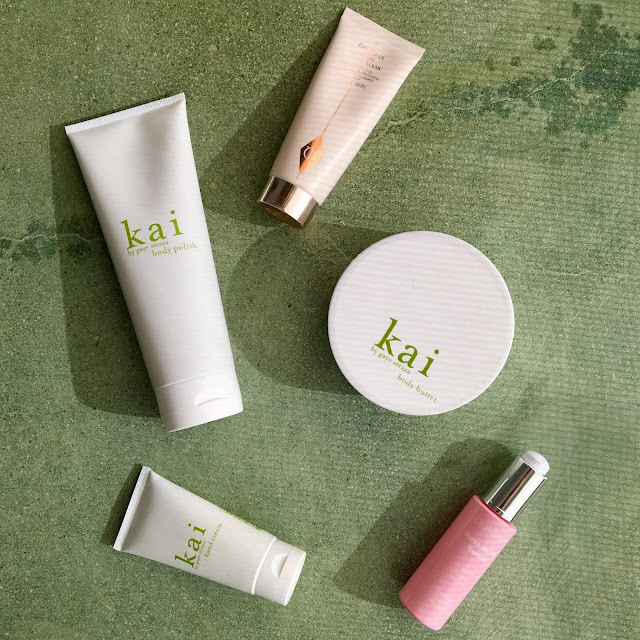 once i’ve turned to a prune i use coconut oil on still-damp skin from head to toe, even in my hair as a mask of sorts, and put kai body butter on top, save for my hair, to seal the deal. throwing my very slippery hair up, i go about babying my face. i’ve been told exfoliating is key to the start of a good at-home facial, more on that later. kate somerville’s exfolikate does the trick without being counterproductive and feeling like i’ve just used sandpaper on my very sensitive, very dry face.i follow my scrub with charlotte tilbury goddess skin clay mask which promises to “lift, smooth, brighten and tighten pores”. sounds good to me. 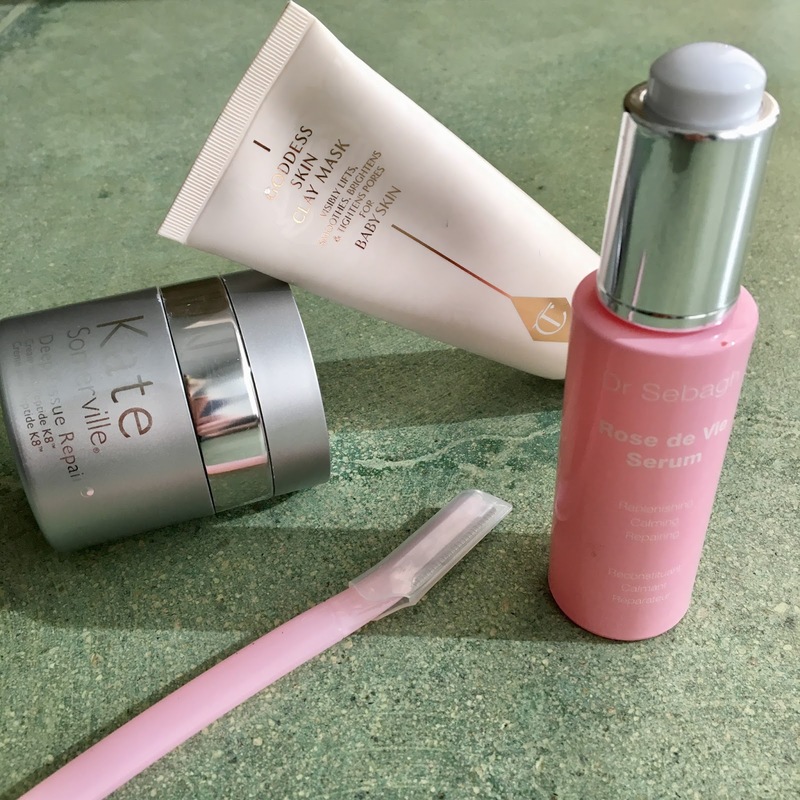 a little dr. sebaugh rose de vie serum and, again love kate somerville products, i add her deep tissue repair as the finale. okay, i’ll come clean, literally, as i’ve skipped one very important step due to the reactions i’m used to getting when telling people i shave. yep, i’m admitting it, i shave my face. please don’t think i’ve got anything to shave, i don’t, but a dermatologist told me the reason men age more “gracefully” than women is due to the constant removal of an unnecessary layer that’s constantly taken away with a good shave. suspiciously i acquiesce using my schick with a fresh blade. pleasantly surprised with the results i’ve continued this maybe on a once a week basis. luckily my stepdaughter found more delicate tools that give the same effect. so sweet, a gift i can really use! i’m pretty certain it works as it leaves my skin softer than soft. i do it before the rose serum to hopefully let all the moisturizing bits soak in a bit more. most of this can be done while watching football which is probably one of the top five things i love to do. bonus! i’m not sure you have the time once a week but even once a month seems to be in order for a little “me” time.